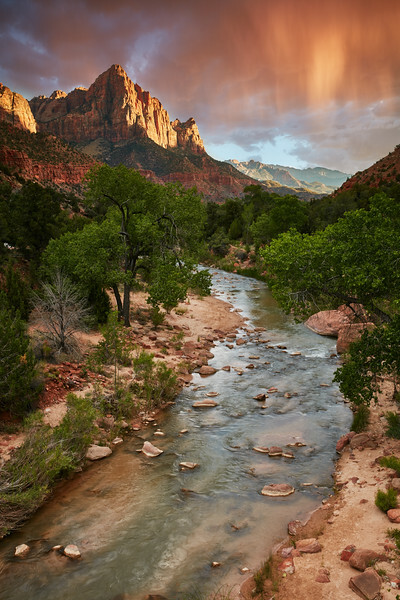 In Zion National Park, a favorite location to shoot the sunset is from the bridge close to Canyon Junction bus stop. The location allows you to have a nice view of The Watchman while including the river in the foreground. It's an absolute cliché shot but one that you need to have in your collection! Now, when you get lucky as I did, you can have a little more original shot with some nice clouds in the case for example. In my case, I witnessed a phenomenon I had never seen before that truly felt like magic at the time: a little before sunset, it started raining over the park and the fine curtain of rain received some warm golden pink light giving it a lovely colour. Zion National Park is probably one of my favorite locations in Utah (although it's honestly very hard to pick one over all the other ones), as it not only includes some beautiful views leaving any photographer hungry for more, hiking The Narrows in a hot summer with water up to your thighs was one of the most fun experiences of the trip.